Since her debut in 1983, singer Priscilla Chan (陳慧嫻) captured many hearts with her wholesome image and a stream of popular hits. Her popularity soared after the release of her classic single “Thousands of Songs” <千千闕歌> in 1989, and survived a long career break when she decided to pursue her college degree in the United States. After the lackluster sales of her last album, Loving Knots <情意結>, in 2003, Priscilla decided to continue her education and retreated from the Hong Kong music scene. Since then, she appeared only at private functions and concerts overseas. On Tuesday, Priscilla surprised fans by announcing her full return to the Hong Kong music industry. Dressed in a chic white jacket and showing off her slender leg in a black open-side skirt, 47-year-old Priscilla looked enthusiastic and as youthful as ever. At the press conference, Universal Music Group announced that they have revived Priscilla’s old record label PolyGram. Priscilla has agreed to a three-year contract and signed on as the label’s first artist, giving her “Top Sister” status. Priscilla added that she is planning an anniversary concert at the Hong Kong Coliseum, but it may not happen this year. She revealed that the Coliseum informed her last month of several available dates in August. Priscilla and her production team want to give fans a spectacular show with lots of surprises, and feel that there is not enough time to perfect it before August. Priscilla promised that she will continue to work with her team and the Coliseum to establish new concert dates possibly next year. 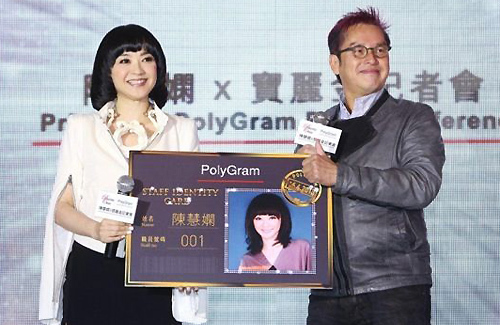 Priscilla’s former label-mate, Alan Tam (譚詠麟), was also present at the press conference and presented her with a PolyGram employee ID card, bearing the ID number 001. On stage, Alan teased Priscilla’s new hairstyle, calling it the “Baat Leung Gum” (八両金) haircut, referencing actor Bobby Yip (葉競生). Priscilla burst into laughter upon hearing Alan’s joke. Hooray for Priscilla and PolyGram’s return! Is reviving the PolyGram label going to make fans nostalgic and stimulate more album sales? Presumably, the staff at the new PolyGram are primarily not the same as 20 years ago. Priscilla Chan does have a very good voice. Good luck, Priscilla, in your new Cantonese album. Very happy to hear about Priscilla’s return to the HK music industry!!! She has such an amazing voice. Her last comeback was a total flop and she disappeared from music scene not long after. What makes it so great that she can handle the competition alongside Sammi, Joey, Miriam and the likes? She’s been away too long. Remember Linda Wong Hing Ping announced her comeback in 2011. Where is she now?! If you compare the popularity of Priscilla Chan with Sammi, Joey, Miriam, she is way under. However, if you compare her voice with the voice of Sammi, Joey, Miriam, Priscilla’s voice is so much better and stronger. If you compare the “quality” of ALL of Priscilla’s songs with those of Faye, Miriam, Joey and Sammi, you would laugh to death because the difference is exactly like a heaven and an earth. This is simply because the qusality of modern generation song writers & composers are simply “suxxxxxs” as compared to those retired ones who brought Jacky Cheung, Anita Mui and Alan Tam to countless glories. I did not include Faye Wong in my post. Some people like Faye’s voice, but personally I think Priscilla’s is stronger and maybe better. Different styles. Faye’s voice is much more suitable for slow R&B, heartbreaking, ballad type of music. She definitely has the emotional prowess to bring those songs alive. As for Priscilla, I haven’t heard many of her hits but her vocal ability is def STRONG. Agree. Different styles and different types of voices. Faye’s voice is softer and has more emotions, but Priscilla’s stronger and more powerful. Most people don’t know this, but Priscilla is making a lot of money in china and she’s pretty popular there. Not releasing CDs or holding concerts – but quite popular. Some singers stopped releasing albums in Hk because nobody buys them now. Why spend months and months on a cd that will be downloaded for free when you can make money singing old songs? When you say faye, you mean faye wong right? If so, I don’t agree the quality of priscillia’s song is heaven compared to Faye. Faye has made some pretty good songs and she can sing just like Priscilla can sing. I’m surprised Faye is lumped with the rest. She’s done a few covers, but she’s also composed a number of good songs and she’s got a fine voice. I loved her album “Restless” – well, Elizabeth Fraser just happens to be one of my absolute favourite singers, so it was pretty easy to fall for the sound on this album. lol..Linda Wong wasn’t even popular back in the days..so of course her comeback in 2011 would not be successful. I can’t wait to hear her new songs! Loved so many of her old ballads. It’s true that Priscilla （慧娴）is currently very popular with the Chinese audience in the Mainland and the same goes with Sandy (林亿莲）. Both have amazingly powerful vocals for the music industry and they’re also taking advantage of what the entertainment biz in China wants and is offering. Faye’s voice is a lot softer and it does have more emotions to play along with it and it’s very similar to Vivian Chow. The only problem is that many of Vivian Chow’s songs are too soft for the Mainland market and not enough substance. I love Sandy Lam. She is amazing with ballad and equally good with fast tempo songs. Can sing and dance well too. All rounded singer. Sandy Lam (林憶蓮) is also one of my favorites, along with 慧嫻. Even though 慧嫻 is not as favored by the general public in the past or present, she is at least a lot better than Miriam, Kelly Chen, HOCC or Kay. Sandy herself is one of the most versatile all rounded songstress, past or present. Just because Priscilla’s songs are out of fashion now, it doesn’t mean that it’s unpleasant for today’s audience. Both Sandy and Priscilla have the same and/or similar demographics in terms of their audience. Both don’t have to go do endorsements at this time (unlike Kay, Miriam, Kelly, Sammi or even Jade Kwan), since they’re constantly in demand in Mainland China, either doing concerts or attending entertainment events. The strategy of bringing back classic singers from the 90s may be primarily to sell concert tickets, especially in the lucrative mainland market. It’s not meant to bring a second peak to Priscilla’s music career. Although I love Priscilla’s voice, Polygram may intend to release a new music album, drum up publicity only to have Priscilla perform in HK and countless cities in China. EP and album releases these days are timed critically as promotions leading up to bigger events. Which makes the album less about the music and more about ticket sales. The same can be said to Sandy Lam’s comeback, which is now centered on performing in multiple locations in China. Pls retired ….sick of your music ……. I’m only 18 but I love all her songs!!! !